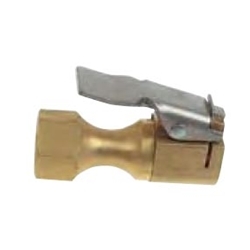 European-Style Clip-on Open Air Chuck 1/4" female fitting Haltec CH-360-OP / Bowes HT CH-360OP. This chuck features the popular European-style clip with a brass 1/4" female fitting. Compact, durable and easy to use, this chuck is available either closed (CH-360) or open (CH-360-OP). Uses replacement washer 10140.